999: Nine Hours, Nine Persons, Nine Doors. It's the story of nine strangers who must escape a boat in nine hours before bombs in their stomachs explode. 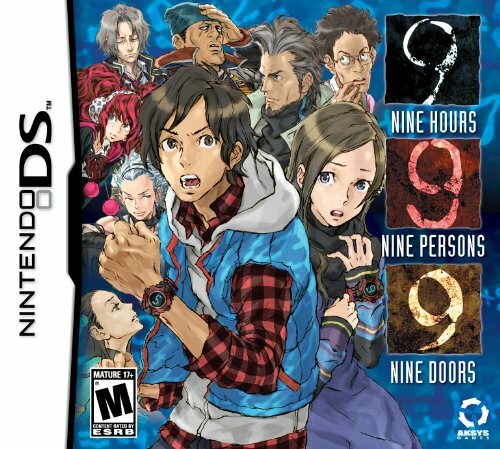 This is straight-up Jigsaw Killer sh*t.
999: Nine Hours, Nine Persons, Nine Doors arrives November 16th for the DS. You ought to buy it. 999:Nine Hours, Nine Persons, Nine Doors is ,from what the demo isand this article from Destructoid, an "Escape the" type of game. If you never played any of the massive amounts of Escape games on the internet in flash form they basiclly lock you in a room or group of rooms with the goal of you escaping. I didn't know there was a market for an actual video game version of Escape games but I gotta say I'm pumped. Ok I'll admit it I had never heard of this game until an hour ago and I also have never been a fan of the style of game. This is most likely due to most puzzles in flash Escape games being derived from an alternate universe were people don't use natural thought process and ingenuity to come to the conclusion but instead but must use the authors weird thought process *Case in point String Banana Stick=Fishing Rod? In one flash escapse game*. But, this game, from what the demo offers, seems to deliver an actually intelligently puzzeling escape game. The main plot is that 9 people are captured by some entiity known as "Zero" and been placed on a cruise ship somewhere in the ocean(?) and have been asked to "play a game"
In all seriousness this 9 people have been chosen to play "the Nonary Game". They have 9 hours to figure out how to escape the cruise ship or bombs in their stomach will blow them up. This actually looks pretty good, aside from the fact that it has an anime style-esque to is. I mean if it was more realistic looking graphics or some sorts then it would have a realism factor to back it up, although it is an M so I might give it more credit than I already have. Pretty sweet, I've always loved the flash escape games so with some competent people writing a story behind it should be decently good.